In 2014 The Allotment helped rebrand the UK’s largest sofa manufacturer, QFC. Since the launch, our work for the market-leader has seen a huge change in the business, with internal and external stakeholders alike widely praising the transformation of not only the brand, but the culture of the business more broadly; with a real focus on questions and innovation in every part of the organisation. To instill this new purpose and proposition even further, we were recently asked by QFC to help develop a new identity for the company-wide intranet, ‘Sofanet’ and a subsequent internal engagement campaign to encourage employees to become more immersed within the business; to become real brand advocates. 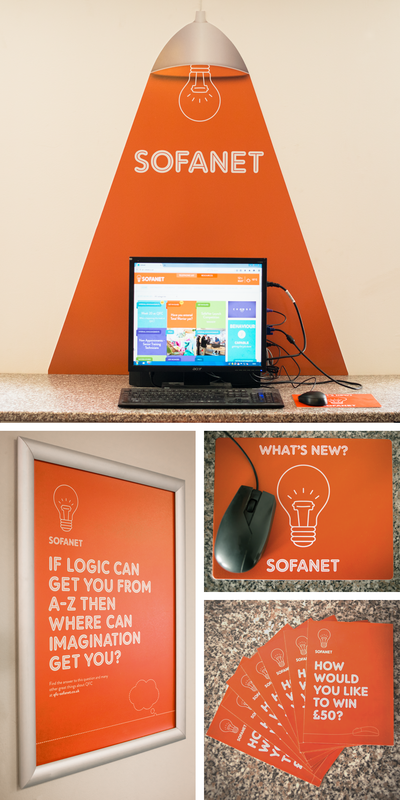 Our response was an identity for Sofanet, featuring a subtle sofa within a light bulb, portraying the ambition for ideas-driven thinking and innovation with sofas at the fore. The identity was rolled out across the new intranet (featured below), with the architecture and design being very much extended from the new QFC website we designed. The logo also featured in the internal engagement campaign, across a range of collateral from posters, roller banners and environmental graphics, where the use of questions pushed traffic to Sofanet to find the answers. In the short period since launch, Sofanet has become the centrepoint for all information regarding the business – a community where everyone can engage with one another and is proving very, very popular. See more of our work with QFC here. Thank-you to Mike Feather for kindly photographing the new work at QFC’s Head Office in Grantham.